Our Lull mattress review of this 10″ foam mattress that has been getting a lot of press lately, being mentioned by People magazine as well as on the Today show. The Lull is a universal comfort type memory foam mattress, designed to appeal to a wide range of sleepers. They have designed their mattress to focus on comfort and support, and to us, they have done a pretty good job with this. On the surface, the 3-layer mattress design with the industry standard (it seems) two-toned cover could at first glance seem unremarkable, but the Lull did a very good job at surprising us with a mattress that should appeal to a wide range of sleepers. The Lull has a pretty standard design that other memory foam mattresses follow, utilizing 3 layers of foam in its construction. The Lull mattress measures 10″ and uses all foam, forgoing the use of latex or other materials. This mattress uses a gel infused cooling layer of memory foam which does a very good job of keeping you cool while also providing a comfortable nights sleep. A 1.5″ Top layer – The top layer is made of gel infused memory foam. This layer is designed to provide cooling and comfort for the sleeper. A 1.5″ Middle layer – This layer is made up of conventional memory foam and is designed to support the body and provide even weight distribution and spinal alignment. A 7″ Bottom layer – This foundation layer is made of dense support foam. This provides the foundation for the mattress that is designed to work with the top layers to create great support. The Lull has a extremely soft cover that is made of 90% polyester and 10% rayon. It helps provide breathability and assist with cooling as well. We felt that the Lull mattress is a medium soft mattress, coming in around a 5/6 out of 10 on the firmness scale (10 being firmness.) As always, firmness is largely weight dependent, as I compressed the top layers more than Kaye did. She felt it was a little firmer than I did, but much less so than other similar mattresses. In terms of support, the Lull does a very good job of providing good support and weight distribution from the combination of foam layers. Both Kaye and myself felt supported during the night in all sleeping positions (we are mainly side sleepers.) The foam layers work well together to provide just the right amount of support without being too firm and causing pressure point pain, or too soft and not providing the support needed to sleep comfortably. This all foam mattress does a very good job at providing a comfortable night’s sleep. The foam provides enough give to allow it to mold to your body, but at the same time not causing you to feel stuck in it. There is a good amount of bounce as well from the gel memory foam layer too, which allows it to be responsive and adapt to changes in sleep position. The softness of the cover combined with the intial soft response from the memory foam layers really makes for a comfortable nights sleep, and this was shared by both of us. Neither of us woke up with any hip or shoulder pain which mattresses that are on the firmer side tend to cause us. In addition, the mattress slept very cool as well, which is important when two sleepers share a bed. The Lull does a good job at preventing heat buildup due to the utilization of the gel infused memory foam and the soft breathable cover. We did not feel any discomfort or stickiness that is often the case with all memory foam mattresses, and Lull did a good job in this respect. We would rate the Lull mattress as above average in terms of not sleeping hot, and is significantly better than most memory foam mattresses in this regard. In terms of sinkage and motion transfer, again with many of these mattresses it is highly dependent on sleeper weight. As I weigh considerably more than Kaye, around 230 lbs, I tend to sink a lot more into the mattress when sitting up or on the edge. When sleeping, however, the Lull memory foam mattress does a good job of distributing my weight and supporting me. Kaye did not experience this amount of sinkage as she weighs half of what I do. Nor did we experience the common phenomenon of her “sinking in a hole” or rolling towards me from the unequal weight difference on the mattress. The memory foam layers in the Lull mattress did a good job of distributing our weight between us. Edge support wasn’t too bad when sitting on it with all my weight, and did a good job as well during the night of not making us feel like we were rolling off the sides. There was a decent amount of motion transfer when I adjusted positions during the night which again is to be expected from the weight differential. This is often a trade-off for us with a less firm mattress, as the firm ones are better at motion transfer but not as comfortable. We did not experience a large degree of smell or odor from any off-gassing when we opened the Lull. There was a small degree of smell but nothing overpowering compared to some other mattresses we have reviewed. Lull is pretty standard when it comes to their warranty and support offerings. 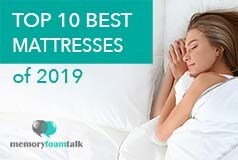 Most mattresses in this category share about the same offerings in terms of sleep trials and warranty, and Lull is no exception here. The Lull memory foam mattress does a good job of appealing to a wide variety of sleepers with a medium firmness feel on average depending on sleeper weight. The all memory foam construction does a good job of providing balance and pressure relieving support as well as a comfortable nights sleep. The Lull mattress sleeps cool and is a good choice for couples that may have different firmness preferences without too much motion transfer or sinkage. All in all, one of the better universal comfort mattresses on the market. We hope this review of the Lull mattress helps you out in your next mattress purchase decision! If you have any questions, feel free to contact us or comment below and let us know! In this Lull vs Nectar review, we’ll take a look at two such companies. Both offer the highest quality all foam mattresses at a fraction of the price of the in-store brands and both have high customer satisfaction rates. 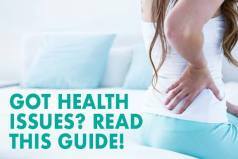 But, which one may have the right mattress for your needs? Read the full Lull vs. Nectar comparison. Read the full Lull vs. Loom and Leaf review. Read the full Lull vs. Leesa comparison. 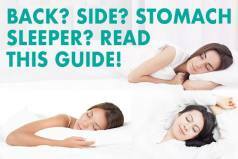 Click here for more Lull mattress comparisons.